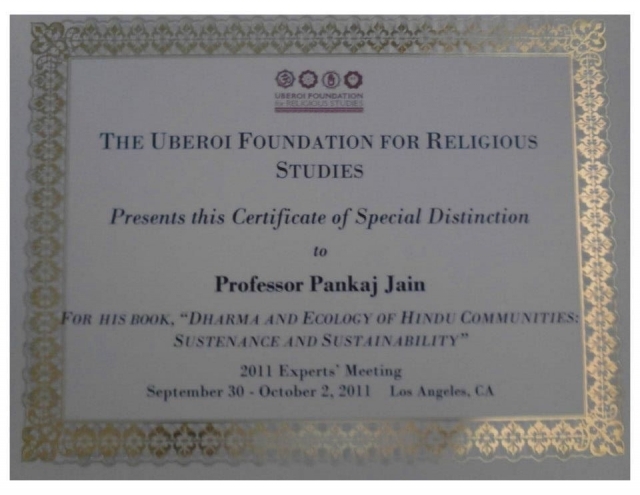 Dr. Pankaj Jain recently published Science and Socio-Religious Revolution in India: Moving the Mountains (January 2017), and is also the author of Dharma and Ecology of Hindu Communities: Sustenance and Sustainability (May 2011), which won the 2012 DANAM Book Award and the 2011 Uberoi Book Award, and is an Associate Professor in the Department of Philosophy & Religion. He has published articles in journals such as Religious Studies Review, Worldviews, Religion Compass, Journal of Vaishnava Studies, Union Seminary Quarterly Review, and the Journal of Visual Anthropology. He also contributes to the Huffington Post, Washington Post's forum On Faith, Times of India's Speaking Tree, and Patheos. Dr. Jain is widely consulted by various media and is interview and/or quoted for various news reports in BBC, Dallas Morning News, NBC, Fox News, LA Times, National Geographic Channel, The History Channel, Slate, Swarajya, Times of India, Indian Express, The indu, Dainik Bhaskar, and India Abroad. His research has been supported by a Fulbright Fellowship, Charn Uswachoke International Development Fund, and Wenner-Gren Grant. His teaching interests include Religion and Ecology, Asian Diaspora, and Sustainability of Religious Communities in Americas. Interested in connecting ancient practices with contemporary issues, he is exploring the connections between religious traditions and sustainability in the USA and in India. He has helped two temples in the Dallas area to get grants from their energy company to help them make more sustainable and energy efficient. One of his graduate students has also designed an environmental curriculum for a Sunday School.Before joining UNT, he taught at North Carolina State University, Rutgers, Kean, and New Jersey City University. He serves or has served as a research affiliate with Harvard University's Pluralism Project, as scholar-in-residence with GreenFaith, as a board member of the Society for Hindu Christian Studies, as the India representative for the International Society for Environmental Ethics, and as a board member of the Executive Advisory Council of Hindu American Seva Communities, an NGO working with the White House Office for the faith-based initiatives. He has presented his research at Columbia University, University of Massachusetts at Dartmouth, University of South Florida, Florida International University, University of Toledo, Texas Christian University, High Point University, Portland State University, Lancaster University (UK), Andhra University (India), Univ of Rajasthan (India), and several conferences, high schools, radio and TV stations, temples, churches, Yoga centers, and other community centers. 2017 Moving the Mountains: Science and Socio-Religious Revolution in India. New York, New York: Routledge. 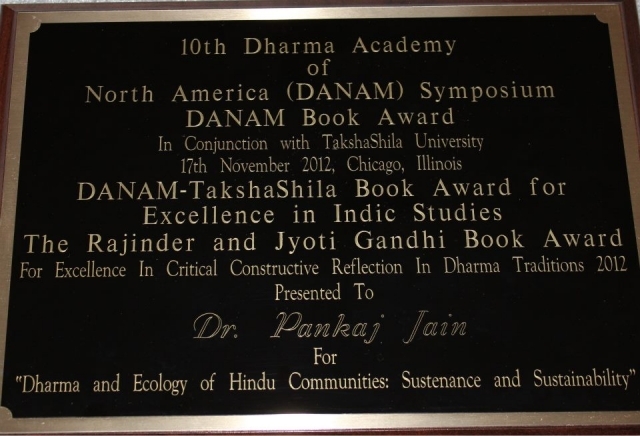 2011 Sustenance and Sustainability: Dharma and Ecology of Hindu Communities. Ashgate, London. (Reviewed in the Journal of Asian Studies, Journal of Dharma Studies, Environmental Values, Food, Culture & Society, International Journal of Hindu Studies, Oxford Journal of Hindu Studies, Philosophy East & West, Religious Studies Review, Sophia, and Worldviews: Global Religions, Culture, & Ecology. Also reviewed in Asia Times). 2014 "Bovine Dharma: Nonhuman Animals and the Swadhyaya Parivar," in Rethinking the Nonhuman: Asian Perspectives on Animal Ethics, edited by Neil Dalal and Chloe Taylor. London, England: Routledge. 2013 "Earth, Water, and Dharmic Ecology: Perspectives from the Svadhyaya Practitioners," in Classical and Contemporary Issues in Indian Studies: Essays in Honour of Trichur S. Rukmani, edited by Pratap Penumala and Jonathan Duquette. New Delhi: DK Printworld, pp. 343-359. 2011 "From Padosi to My Name is Khan: Portrayal of Hindu Muslim Relations in South Asian Films" in Journal of Visual Anthropology, 24.1. 2011 "Such a Long Journey: Portrayal of Parsi Community in Films" in Journal of Visual Anthropology, 24.1. 2010 "Bishnoi: An Eco-Theological "New Religious Movement" in the Indian Desert" in Journal of Vaishnava Studies, 19.1. 2010 "Virtue Ethics of Boot Polish and Dosti vis-à-vis Slumdog Millionaire" in Journal of Visual Anthropology, 23.1, pp. 44-50. 2010 "From Kil-Arni to Anthony: Portrayal of Christians in Indian Films" in Journal of Visual Anthropology, 23.1, pp. 13-19. 2010 "Renunciation and Non-renunciation in Indian Films" in Religion Compass, 4(3), pp 157-165. 2014 "Youth Led Environmental Awareness: Initiatives towards a Jain Faith Community Empowerment," presented at the Society of Applied Anthropology, Albuquerque, New Mexico. 2013 "Ethnobiology of Hindu Communities in India," presented at the Annual Conference of the Society of Ethnobiology at the University of North Texas, Denton. 2013 "Sustainable Development in the Himalayas: The HESCO Way," presented at the Annual Conference of the Society for Applied Anthropology, Denver, CO.
2011 "Hinduism and the Environment," presented at the Conference Energizing Dharmic Seva: Impacting Change in America and Abroad, organized by Hindu American Seva Communities at the White House and Georgetown University, Washington DC.